How do you put “technology” and “democracy” together in a museum? First published in volume 14 of eg, the Experiential Graphics Magazine, a publication of the SEGD, this article explores the changing definition of museums and interactive spaces. 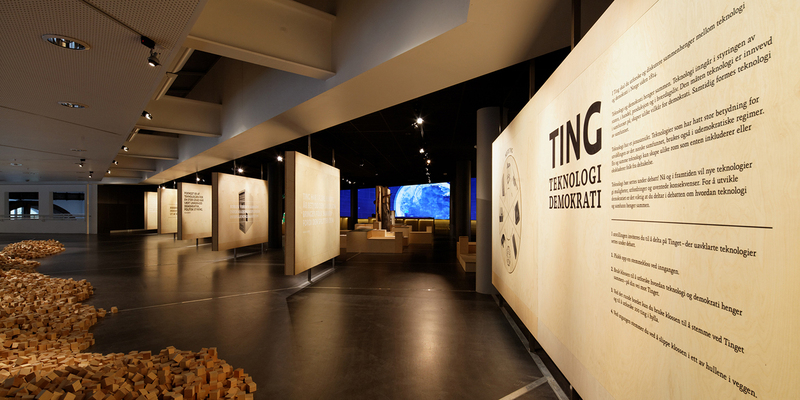 Design firms Ralph Appelbaum Associates and TAMSCHICK MEDIA+SPACE GmbH won a 2015 Honor Award for their exhibit “Ting” at the Norsk Teknisk Museum. Read the PDF version: eg14_ting. At Oslo’s Museum of Technology, Ralph Appelbaum Associates creates a new kind of participatory museum experience. How would you answer this question: “Do you think it is possible to control technological development in a democracy?” It may sound like a college essay question or the beginning of a TED Talk, but this thoughtprovoking theme is the central focus of an innovative new exhibit at the Norwegian Museum of Technology in Oslo. Ventimiglia recalls that the team’s initial brainstorming sessions were rather unproductive: “How can you exhibit democracy? We couldn’t even get our teams to agree on what democracy is.” Most museum exhibits explain a tangible topic through artifacts and narratives, but exploring the impact of inventions on democracy (and vice versa) within a museum setting was an abstract, elusive, and scholarly proposition. The breakthrough came when Ventimiglia reframed his mission: “Instead of explaining it, let’s enact democracy,” in a sense, “putting technology on trial” and prompting visitors to evaluate technological innovations and debate and vote in a democratic forum. Tamschick recalls Ventimiglia sketching “a sputnik—a circle with lines radiating into it, gathering visitors together” to show a central space where visitors could analyze and discuss these substantial topics. Over time, the circle became a large round table, 13 feet wide in diameter, as Tamschick says, “a tool that everyone knows” and one designed to spark conversation. Now the exhibit had a name—TING: Technology and Democracy—and a rich cultural legacy to build upon. While the ting would be the center of the experiential exhibit, Ventimiglia and his team recognized a need for some browsable and lessstructured displays that would act as a prologue to the dialogue in the Ting. When you ascend the museum’s central stairs and turn into the exhibit space, the first thing you see are mounds of plain wooden blocks on the floor in front of angled plywood panels that introduce the exhibit. Pick up a block and you’ll soon realize this unassuming cube is your key, your vote, and your voice to engage with the exhibit and with your fellow visitors. The block had playful and practical origins. Tim Ventimilgia was inspired by watching his 4-yearold son Felix playing with blocks and arrived at this very low-tech device for conversing about leadingedge technology. The high tech/low tech dichotomy sparks questions about how we interact with tools and what makes them effective and familiar. Visitors assemble in a dramatically lit amphitheater circumscribed by an 85-foot long, 16-foot-wide arched wall of shelves that encircles one side of the Ting table. One hundred artifacts— from a bullhorn to a waffle iron—each framed in their own nook, sit on the shelves. (Why a waffle iron? Curator Henrick Treimo explains that waffles were and are a common and [literally] sweet accompaniment to Norwegian cultural gatherings, “which are important to the democracy as they create a sense of community and belonging.”) A sophisticated lighting system can either illuminate the object itself, or using what Ventimilgia calls “a very old theater trick,” video can be projected over the objects on a seamless transparent scrim, creating a 180-degree projection surface. 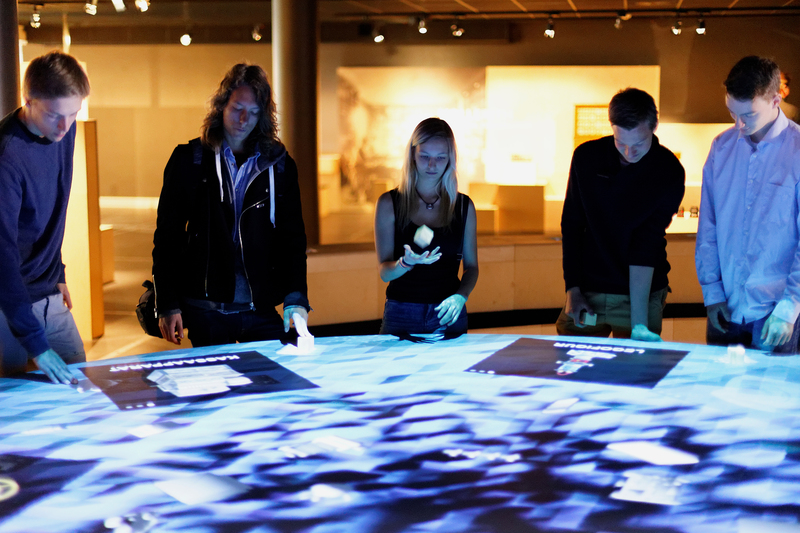 Ambient pixelated waves wash over the ting table, projected from above, attracting visitors to gather around it. They can interact with the giant curiocabinet by putting their block on a corresponding image on the table, which then initiates a descriptive animated interlude on the wall. For example, a length of railroad rail iron poised in its niche dissolves into a larger-than-life locomotive barreling right at you. Sensors above the table track the positions of the blocks and a show controller launches corresponding video clips projected on the rounded wall. 140602 TING MASTER small from RAA Media on Vimeo. Ting sessions run from 8 to 30 minutes depending on the number and age of the visitors. 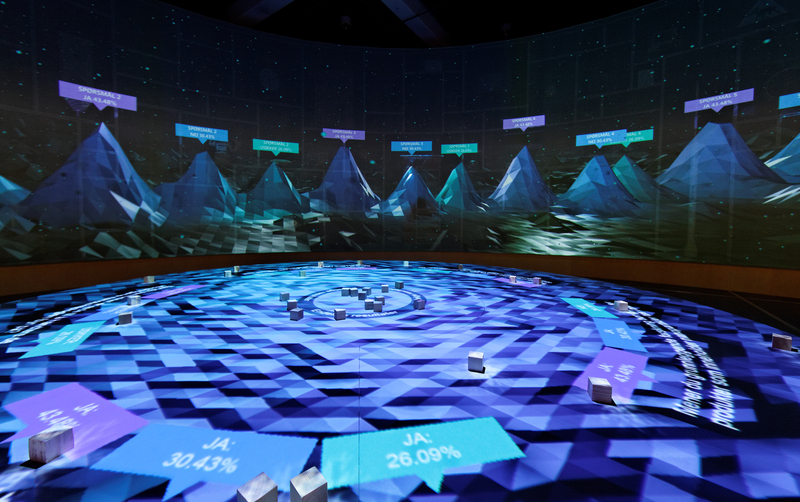 Each session ends with a real-time video visualization of the current group’s votes in the context of previous sessions—a visual metaphor for a democratic world cumulatively built by individual choices. Leslie Wolke (lesliewolke.com) is a wayfinding technology consultant and writer based in Austin and New York City. This entry was posted on December 1, 2015 by lwolke in Publications.